The Biblical World: Ancient Christian Prayer Box Discovered in Jerusalem Parking Lot. Ancient Christian Prayer Box Discovered in Jerusalem Parking Lot. The Israel Antiquities Authority has announced the recent discovery of a Byzantine era prayer box found in the City of David excavations. 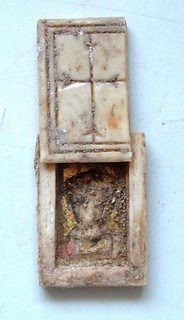 The box is about the size of a matchbox, is made of bone and has two figures carved on it. Here is part of the IAA report. You can read the rest of the report here and an article in Ha Aretz Here. This is interesting! Although according to the dimensions on the second website you cite, it is much smaller than a matchbox (in the image there it appears to be just slightly bigger than a finger tip).